Global emergence of antimicrobial resistance threatens therapies that combat infections by bacterial pathogens. Resistance genes detected in city sewage may serve as a proxy for the resistance burden of their urban populations. Professor ZHU Yongguan from the Institute of Urban Environment of the Chinese Academy of Sciences and his collaborators recently conducted a nationwide survey of antimicrobial resistance elements in China's urban sewage and showed that the distribution of antimicrobial-resistant genes (ARG) was characterized by the well-known "Hu Huanyong line," which delineates a striking difference in the distribution of China's population. This demonstrated that the emergence of ARGs is driven by human activity. A total of over 116 urban sewage samples from 32 wastewater treatment plants across 17 Chinese major cities were investigated in this study. Urban sewage was found to possess high levels of antimicrobial resistance genes – around 1011-1012copies per liter. The occurrence of antimicrobial resistance in urban sewage has a distinct seasonal pattern and the antibiotic resistome is extensively shared in urban sewage across China. This study revealed that municipal sewage harbors diverse and abundant resistance genes. In total, 381 different resistance genes conferring resistance to almost all antibiotics were detected and these genes were extensively shared across China, with no geographical clustering, highlighting that municipal sewage could be a major conduit for transferring antibiotic resistance genes into the environment. Adults harbor significant quantities of resistance genes in their gut microbiome, primarily owing to antibiotic usage in infection treatment. In particular, the frequent presence of multi-antibiotic resistant "superbugs" in human feces predicts a return to the pre-antibiotic era, where a growing number of infections can no longer be treated using the current arsenal of drugs. Urban sewage is a catchment receiving antibiotic-resistant bacteria from the gastrointestinal tracts of tens to hundreds of thousands of urban residents. The antimicrobial resistance distribution detected in urban sewage can serve as a proxy for the resistance burden map of their urban populations. The research data demonstrated that urban sewage is potentially a major conduit for dissemination of anthropogenically derived antibiotic resistance into various environmental compartments. This work provides a baseline for investigating the environmental dissemination of resistance elements, and raises the possibility of using the abundance of ARGs in sewage as a tool for antibiotic stewardship. These findings were recently published in Microbiome (Zhu, Y.-G., et al. 2017). 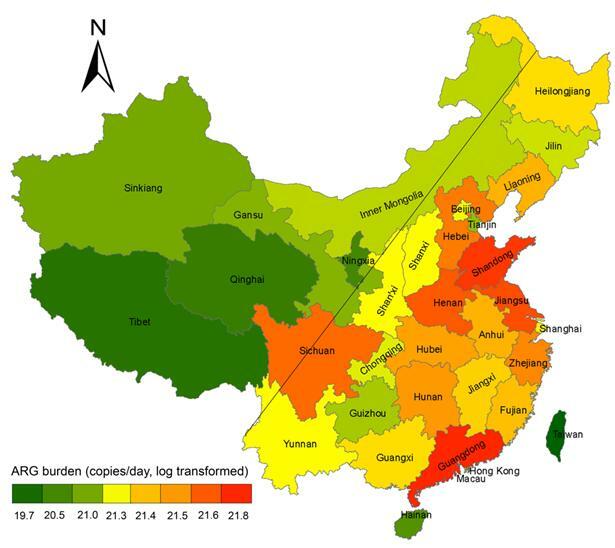 "Metagenomics of urban sewage identifies an extensively shared antibiotic resistomein China," Microbiome 5: 84, DOI 10.1186/s40168-017-0298-y, https://microbiomejournal.biomedcentral.com/articles/10.1186/s40168-017-0298-y). This study was conducted with collaborators from the University of Hong Kong, Zhejiang University and Macquarie University. This study was financially supported by the National Key Research and Development Plan, the Natural Science Foundation of China, the Knowledge Innovation Program of the CAS, the International Science & Technology Cooperation Program of China, and the Youth Innovation Promotion Association of CAS.